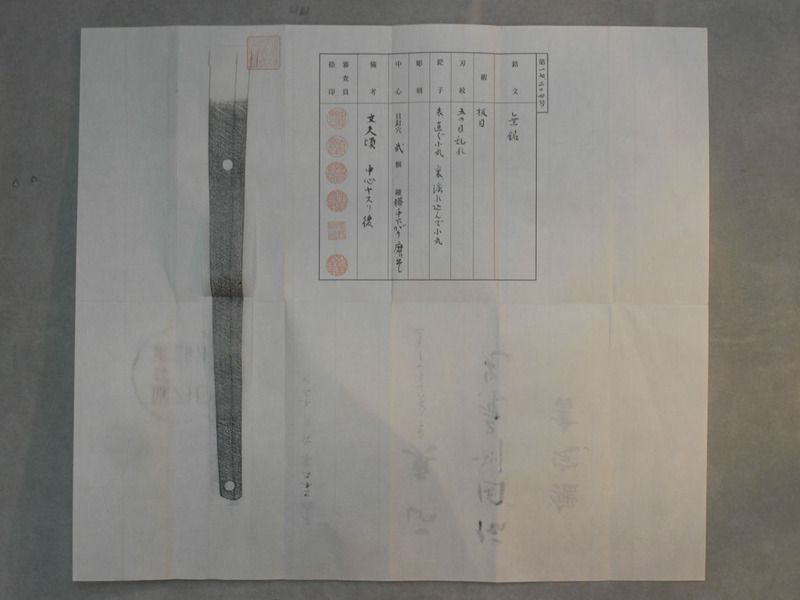 It is unusual to come across a tachi sword that was made after the Warring States period in Japanese history ended. 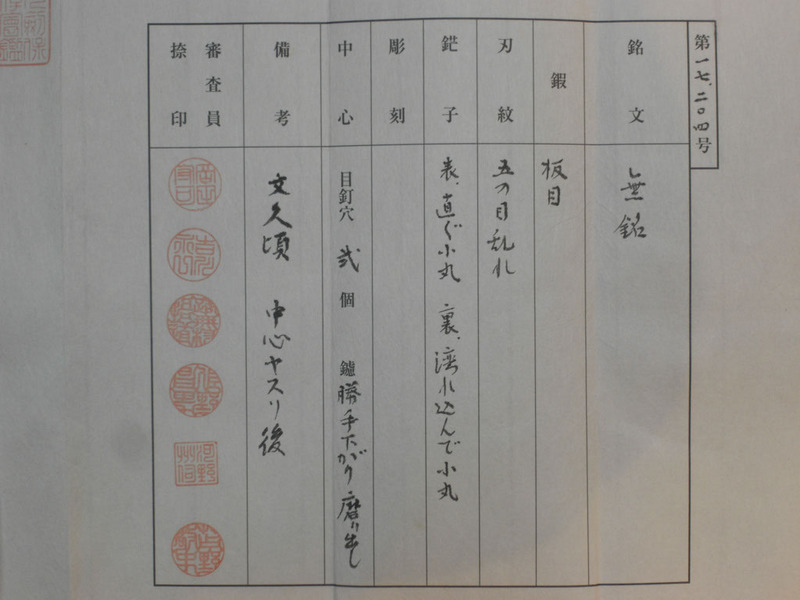 Although school textbooks tend to suggest that after the Battle of Sekigahara in 1600 Japan entered into a period of peace and the samurai became effectively redundant, a more inquiring look at the history will however reveal that the samurai had more battles to fight up to and including the Shimabara Rebellion of 1637-1638: A battle that the famed Musashi Miyamoto took part in and during which he was knocked from his horse by a rock thrown from the fortifications he and the Shogun’s army were besieging. 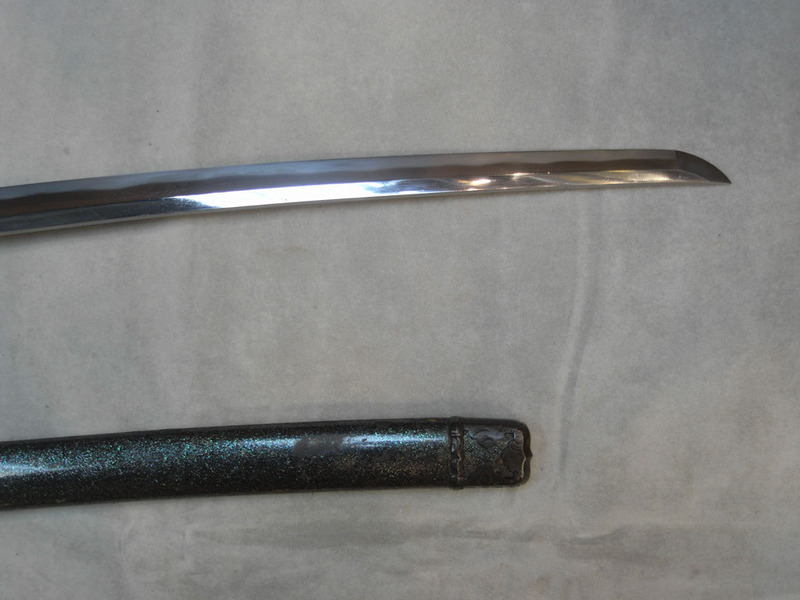 Tachi are long battlefield swords commonly used from horseback. 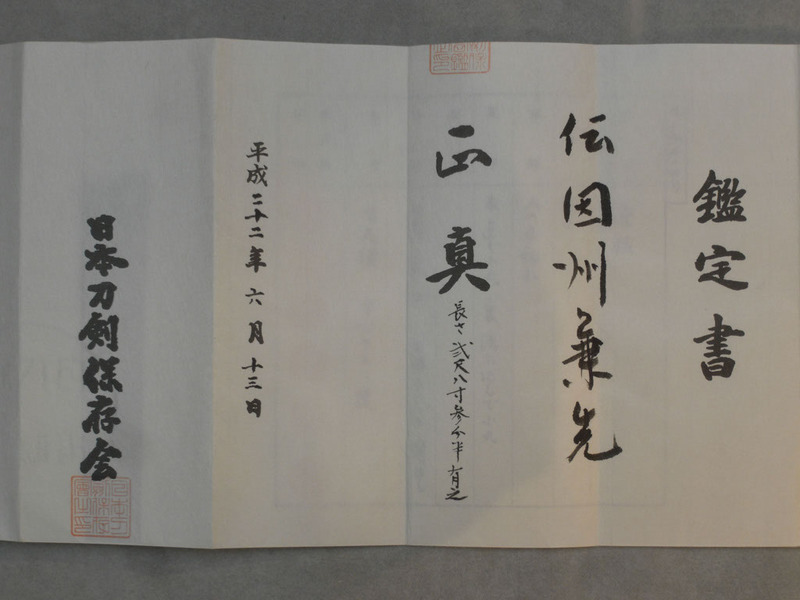 They are not usual dating from the Edo Period of the Tokugawa Shogunate; most samurai had their swords shortened to a convenient length of around 69cm-72cm to wear in the blade up, thrust through the obi (sash) style which most people associate with the “katana”. Swords for the battlefield however were more commonly worn in different mountings suspended by two straps from the belt. 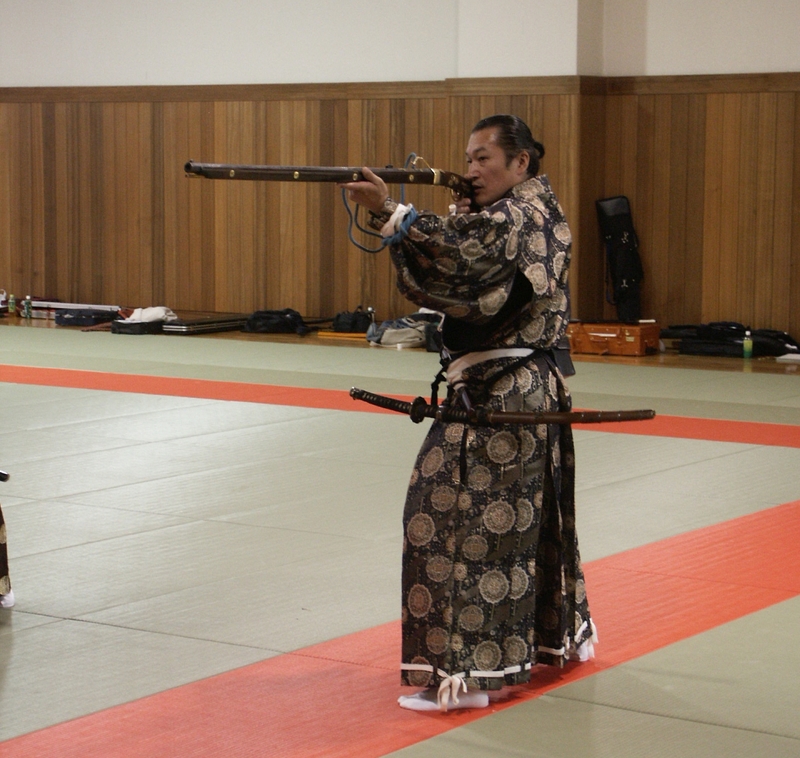 An Edo period sword worn tachi style by a member of the Takeda clan as he demonstrates an Edo period matchlock musket. 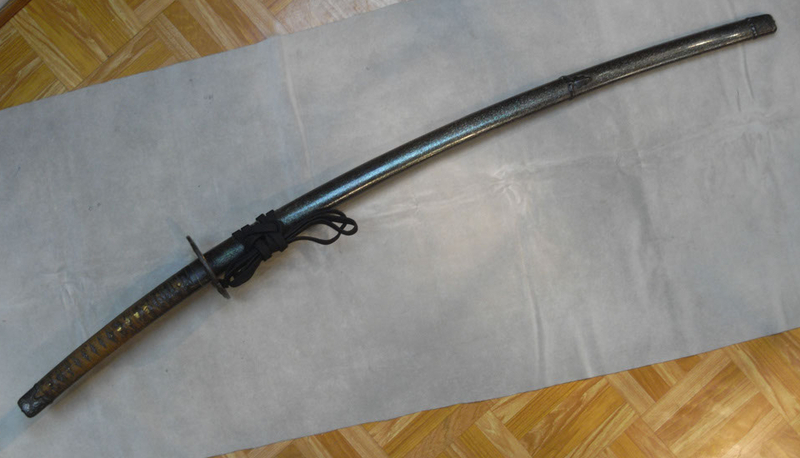 The sword we are featuring in this article has an 89.5cm blade and is in han-dachi koshirae (half tachi mountings). 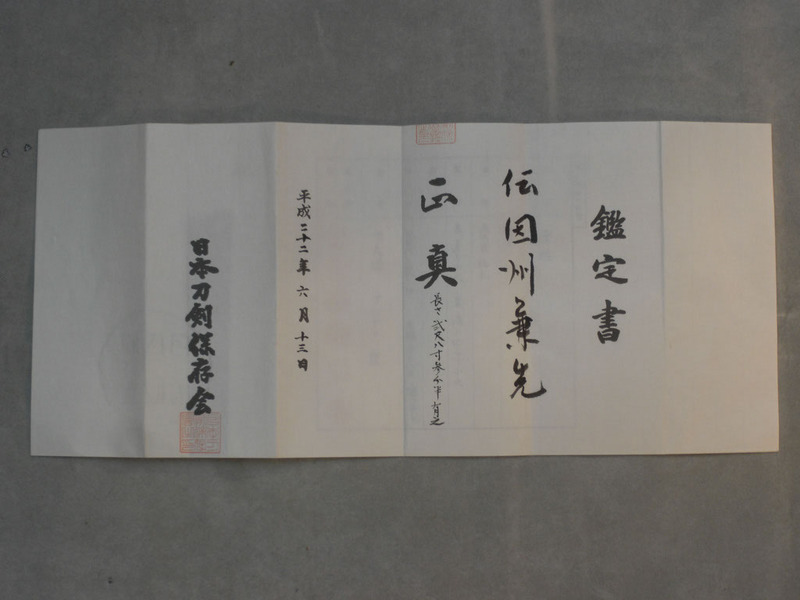 Although the sword does not have any inscription on the tang it has been examined and certified as being the work of Inshu Kanasaki, a swordsmith who lived in Hiroshima and who is recorded to have made swords at Hiroshima Castle in the early Edo period. His work on this sword shows strong Mino-den influence. Habaki and first part of blade. Mid portion of blade. 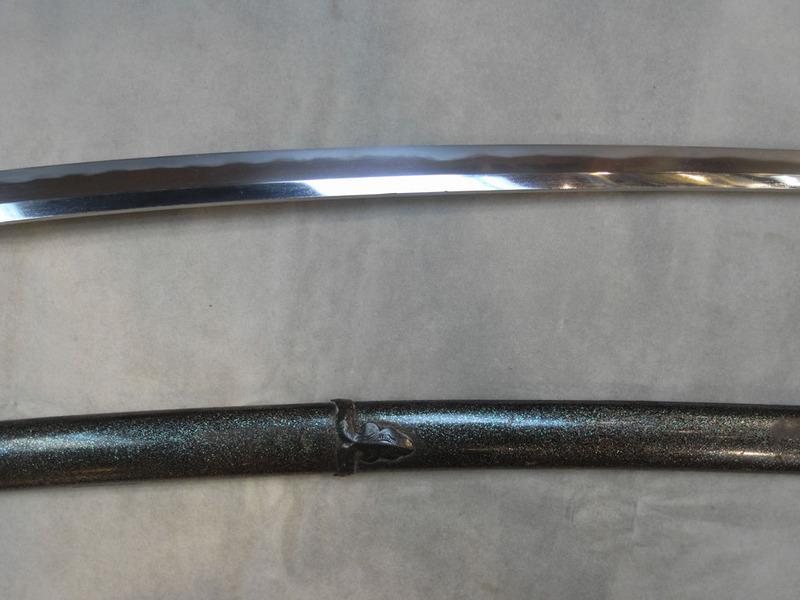 The saya (scabbard) has a ground abalone shell lacquered finish. 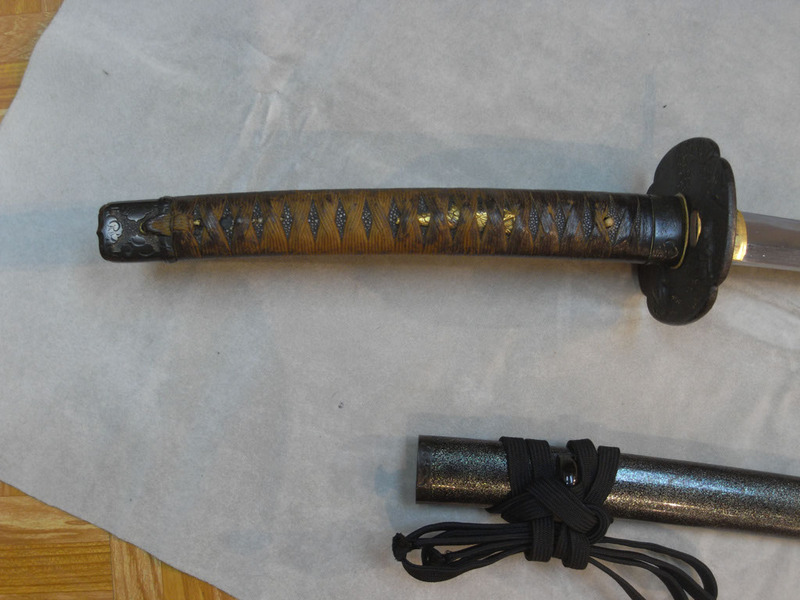 Front section of blade and kissaki. 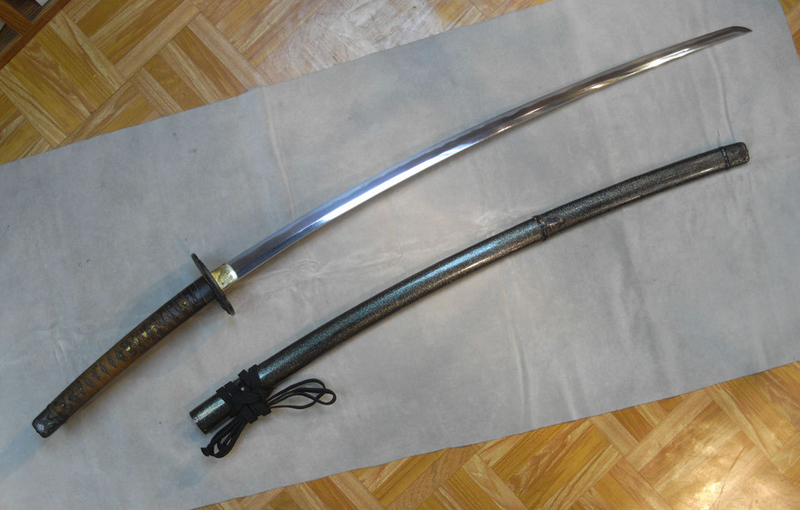 Interestingly the han-dachi mounted swords were actually worn in the blade up, thrust through the obi style associated with the katana. 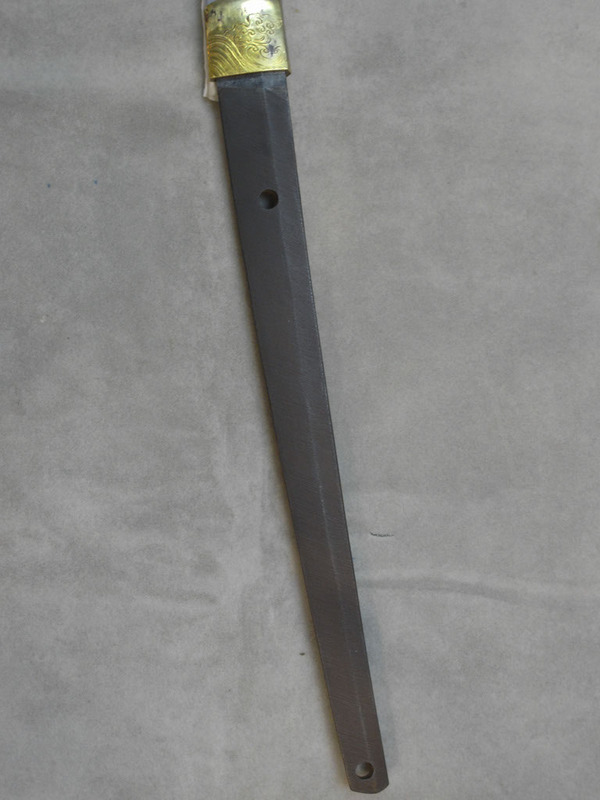 As this blade is almost 34 inches long it would have required a specialized technique in order to draw and sheath it. It is fully 6 inches longer than a typical katana. 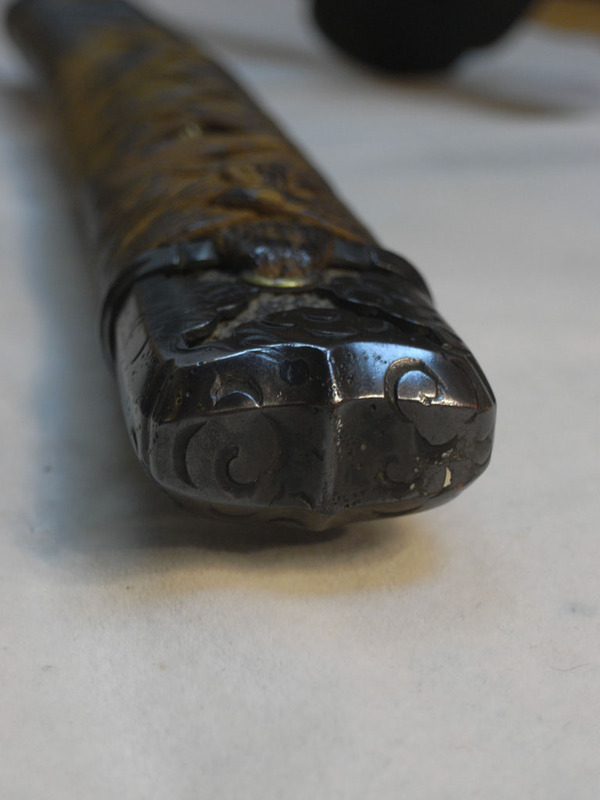 The tsuka of this sword features a kabuto-gane typical of tachi mountings rather than a kashira. 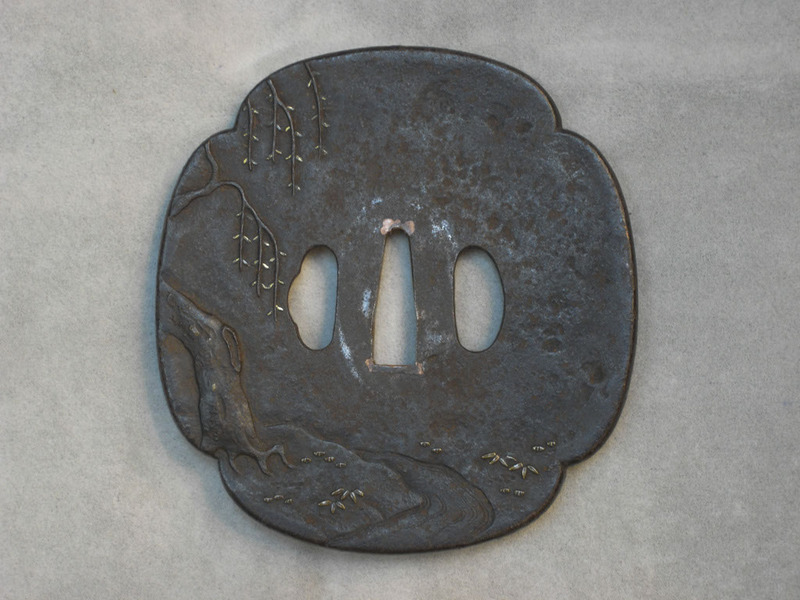 The tsuba (hand guard) of this sword is large at around 5 inches in diameter. A size of around 4-5 inches is quite typical of swords intended for combat as they provide more protection for the hands. 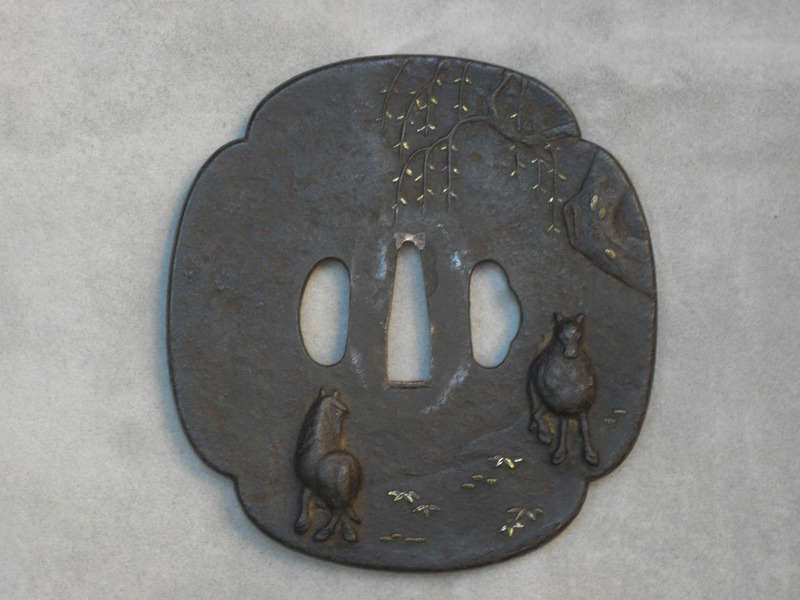 The tsuba features a horse, willow and water theme. This likely symbolized the strength of the horse, the giving flexibility of the willow to give and bend and so survive a force too strong for it, and a flowing river to symbolize that one must flow and be fluid in action. You can find a full set of pictures of this sword here. 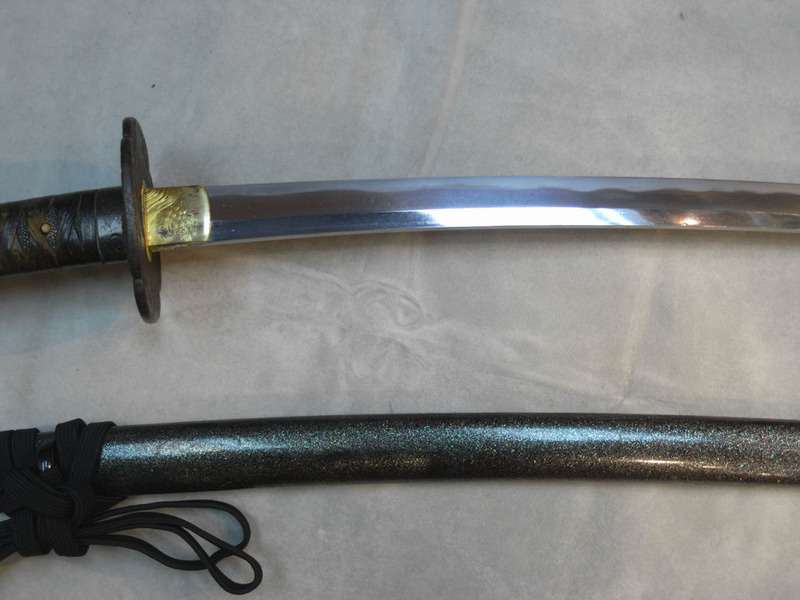 If you are interested in further information on this sword e-mail Mr. Lok at info@hk-sword.com and please mention that you saw this post on revivaler.com.